The Hg80® Hinged Knee Brace is the most comfortable brace to wear for weak or injured knees. Designed for maximum support and comfort, the Mueller Hg80 Hinged Knee Brace offers a Triaxial hinge design that properly tracks the knee joint producing near normal motion. The tibial containment system along with a secondary shell and patella buttress help support the leg and relieve pain while stabilizing the patella during activity. The upper and lower strapping system offers added compression to lock the brace in its proper position. The sleeve features Mueller's exclusive HydraCinn® fabric with an antimicrobial application to help you stay cool and dry. The moisture-wicking material provides better heat management and enhanced comfort for greater performance. Hydracinn material provides support and comfort. Triaxial hinges provide maximum support, yet allow you to bend and flex your leg. Upper and lower strapping locks the brace in position. Hourglass design conforms to the shape of the leg. Silicone grip strips provide no-slip support. 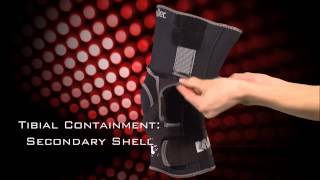 Tibial Containment System: shell, stabilizing patella buttress, and rear support strap help protect the leg. Four sizes: Small, Medium, Large, XLarge - see sizing chart tab. Style: 5401. Hinged knee brace. Prophylactic protection for any type of contact sport. Conditions requiring enhanced support of the limb. 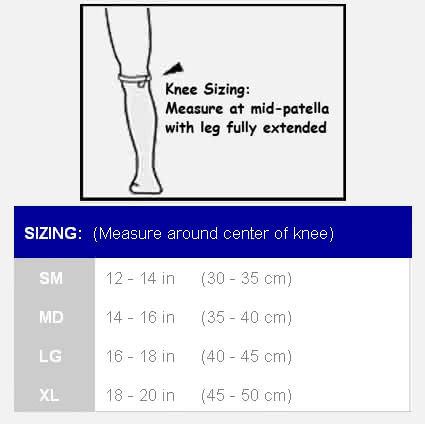 Sizing Chart: Measure circumference around center of knee. Loosen all of the straps. Fasten large top and bottom areas behind knee. Secure upper and lower straps. Contains neoprene and natural rubber latex which may cause allergic reactions or skin irritations. 35% nylon, 25% polyester, 25% aluminum, 12% spandex, 3% silicon. After crashing on my motorcycle and several leg and knee surgerys this is a much needed relief. I have worn it every day for months and it has held up great. I love my Mueller Hg80 Hinged Knee braces. I have hypermobile knees, arthritis, and have had a meniscus repair. My knees hurt and are unstable. I wear my braces nearly everyday all day. My Mueller Hg80 Hinged Knee braces relieve most of my pain. They are breathable and do not restrict my movement. They also have patella support under the knee. This is my second pair and with daily use they seem to last about a year. They do seem to run a little small. Freedom of movement is excellent. I feel virtually no restriction as I kick, plant, pivot, grapple, etc. The HydraCinn material allows your skin to breathe and so your knees don't get so sweaty. It really does what it purports to do. Moisture is wicked away and the anti-microbial aspect keeps it as clean smelling as possible. It's also easy to wash by hand and drys quickly. I've had mine for seven months, washing it by hand or machine almost daily. It's still in excellent condition. The only problem I've had is that due to the rough and tumble nature of martial arts, the material covering the hinges has worn away somewhat and I've had to tape it up. I'll be using only this brace until technology gets better. The price may be higher than the average brace but it's well worth it. Returned. Just not what I liked. You have to slip it on then Velcro it. I bought one that just velcros on. Works great and fits. It is non allergic for me as others have been.